Oh thank you! For some reason however, the picture of the award is not showing up. ALso, did you just take down your picture because it's not there anymore...I guess I answered my own question, huh? I have an idea for a new picture, and I just hate that stupid blanket!! Thanks!! I'll pay it forward - but the image doesn't seem to be there? Can you re-post or send it to me in an email? I love dooce too!! And her adorable patient dog Chuck! "You like me, you really, really, like me!" 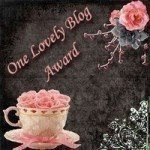 Thank you for this award, truly I am flattered that you like to read my advice and follow my life! I feel the same about you, I check daily and read with interest - keep up the good work! I gave you the award too, sincerely - because I really enjoy reading about your life. Congratulations!